Finally you can work with confidence on the setup you have. 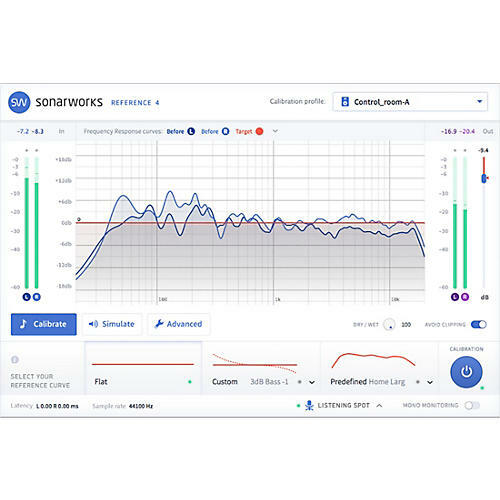 Sonarworks Reference 4 removes unwanted coloration from your studio speakers and headphones, so you can trust that you hear your mix accurately. Reference 4 Studio Edition offers the full package of highly powerful software, providing consistent reference sound both in the studio and on the go. Measure your studio with the included mic, it takes around 10 minutes. Reference 4 then creates a calibration profile. For headphones select a pre-made profile and you're ready to go. Calibration can be run in DAW via plug-in for lowest latency or via Systemwide for maximum versatility.